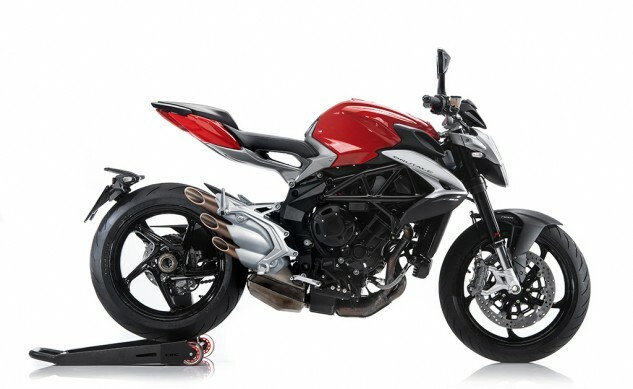 When a press release for one of our favorite motorcycles starts with “The New Brutale 800 changes completely to remain loyal to itself,” we can’t help but think, “OK, MV Agusta, we’re pretty immune to hyperbole here at MO, but you’ve certainly piqued our interests.” Last week, a leaked video had already stirred the Brutale 800 pot. So, the time has come to find out what MV has up its sleeve? Well, it looks to be quite a lot, actually. Visually, the front end has been radically reshaped with an elliptical sculpted LED headlight. Not to be outdone, the back of the Brutale 800 features a uniquely shaped alloy saddle chassis sporting a dual saddle with hidden passenger grab rails. The tail of the bike receives the full LED treatment, as well. 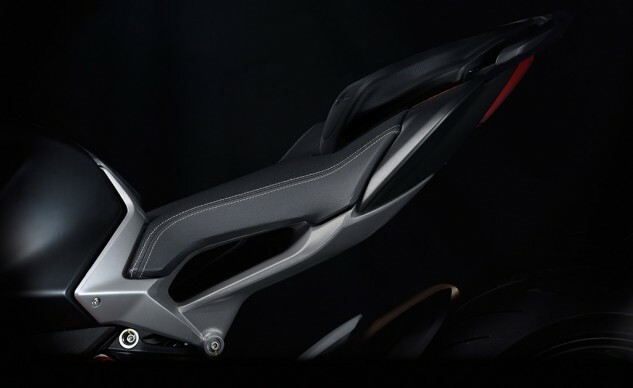 Between the stylish front and rear lies a trapezoidal tank which retains its 4.4 gallon capacity and integrated airbox – all of which combine to produce an aggressive profile. The chassis has been updated with a 0.8-in. longer wheelbase, now 55.1 in. Additionally, the trail has grown to 4.1 in. (a 0.3 in. bump). 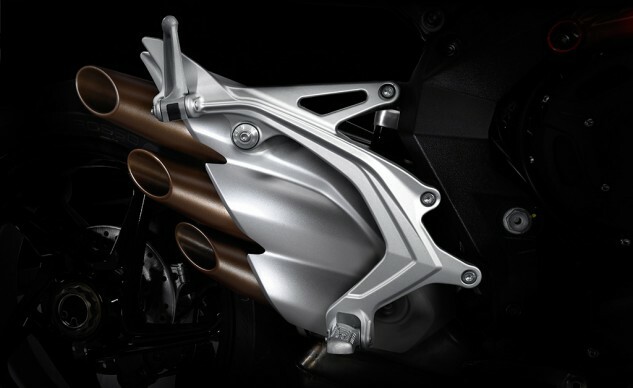 The frame’s ALS steel tubing mates with aluminium alloy clamps in the rear area of the pivot of the single swingarm. Surprisingly, the troubled suspension company, Marzocchi, supplied the 43 mm, 4.9 in. travel, inverted fork. A Sachs shock makes sure the rear Pirelli Diablo Rosso III tire stays in contact with the pavement. The engine, with its counterrotating crankshaft received some notable updates. Somehow, MV’s engineers managed to deliver 116 hp at 11,500 rpm plus a 25% increase in torque to 61 lb-ft at 7,600 rpm while still meeting the Euro 4 emissions standards. Just for yuks, they made 90% of the torque available at 3,800 rpm. The reshaped and newly capacious exhaust (now 3L in volume) no doubt had something to do with the torque increase. The new hydraulic clutch is a nice touch, but it won’t get as much use thanks to the new electronic EAS 2.0 up-and-down gear shift. 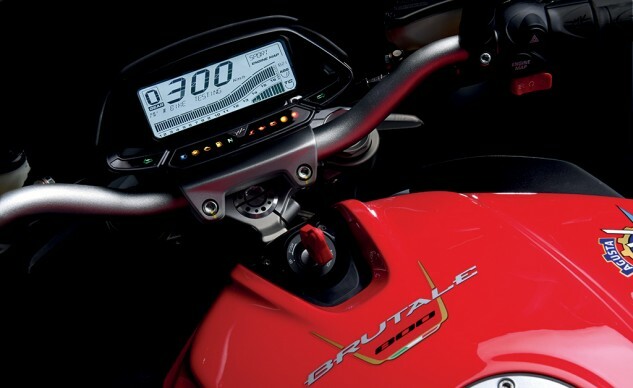 The engine’s management duties are handled by the MVICS system for the ride-by-wire throttle and an 8 setting traction control. Brembo provides the brakes. Dual 320 mm floating discs are gripped by four-piston calipers in the front. A two-piston caliper and a 220 mm disc take care of the rear wheel. Standard ABS is provided by a Bosch ABS 9 Plus control unit. Colors will be: Ice Pearl White/ Matt Metallic Graphite, Red/Matt Silver, and Black Matt Metallic/Matt Silver.